Are you ready to look younger? Tighten and tone that loose skin. Get the results you're looking for. Any skin color including tanned skin can be treated. It is FDA cleared, non-invasive procedure. Treatment uses BiPolar RF to boost collagen and elasticity deep within the skin. No post procedure down time. "Facials and skin care products take care of the surface of your skin, but our RF works deeper on the foundation that supports your skin. " results will continue to unfold over the course of 3 - 6 months taking you to a more firm and youthful appearance, including tightening and firming of the skin under the chin, on the neck, along the jowl line and brows. You can choose the area you are most concerned with. RF does not duplicate the results of surgery. It simply has proven to be an alternative for those who want to firm without the surgery. RF can also be done on the abdomen and legs to aid in smoothing cellulite and increasing firmness in the area. "Did you get Botox done?" "Are you using new makeup?" "You look great, what are you doing?" "Did you lose weight?" "My turtle necks are loose." "My face feels tighter and my skin does not blow in the breeze when I dry my hair!" "When I have face forward photos taken, my chicken neck is not visible!" My jowls are disappearing." " I had a few sessions of the RF skin firming treatment. I can't believe the difference and it continues to improve as the weeks go on. Love this new technique. It works!! " B.O. The skin tightening treatment works with RF Radio Frequency to strengthen existing collagen fibers that have weakened over time due to aging and various forms of stress. Bi-polar RF energy heats the dermis and stimulates collagen synthesis to strengthen existing collagen fibers for improvement in skin laxity, sagginess and texture. 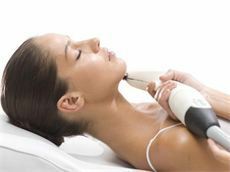 An immediate contraction of tissue fibers results in a smoother and tighter appearance of the skin. Results will continue unfold over the course of 3 to 6 months as the collagen continues to rebuild. 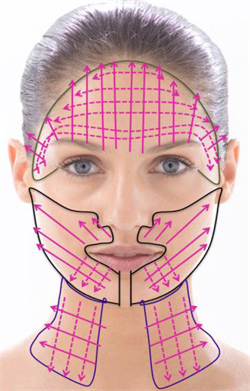 The skin tightening treatments are suitable for facial treatments including the jowls, cheeks, brows and the sensitive zones of the eyes and forehead, as well as the neck, décolleté and underarms. Each treatment session lasts approximately 15 - 20 minutes per area. IS IT SAFE? Yes, the treatment is safe, effective and has no adverse effects. The treatment involves a unique skin cooling mechanism along with an applied cooling gel for maximum comfort. A treatment course of 4 - 6 sessions is recommended for optimal results. * If you've looked closely in the mirror recently, you probably came across a new wrinkle or noticed 'excess baggage' around the eyes. Think you can't defy the laws of gravity? Think again! Our RF Core breakthrough skin tightening treatments instantly contract tissue fibers for immediate smoothing and plumping results. 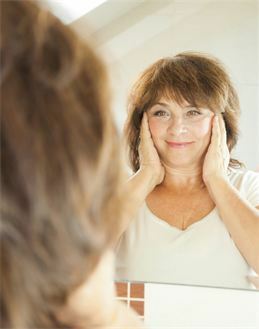 Collagen fibers are also strengthened for long-term tightening, rendering smoother, tighter skin. * Number of treatment sessions required, and final results may vary per individual. Age, fluctuations in weight during or following your treatments, smoking and extreme sun tanning may have an adverse effect on the results you will achieve. ••Any skin disease in the treatment area. ••Treatment over tattoo or permanent makeup. ••Cardiac pacemaker, defibrillator, or other implanted electronic device. ••Blood coagulopathy or excessive bleeding or bruising. ••History of deep vein thrombosis. ••Use of Accutane within the past 6 months. vitamin E, garlic supplements, ginkgo, ginseng, St. John’s wort). carcinoma, provided the condition is excluded from the treatment area). subcision), 3 months prior to treatment. ••Any history of disease which may be stimulated by heat, such as Herpes in the treatment area. ••Any endocrine disorder, such as diabetes.